It was a dark and stormy night … OK, it was a dark and stormy morning when I got to the photo blind (also known as a hide) an hour before dawn, as is required by the refuge rules. The photo blinds are all extremely well built and clean. This blind in particular is usually good for ducks, geese, waders and shorebirds. 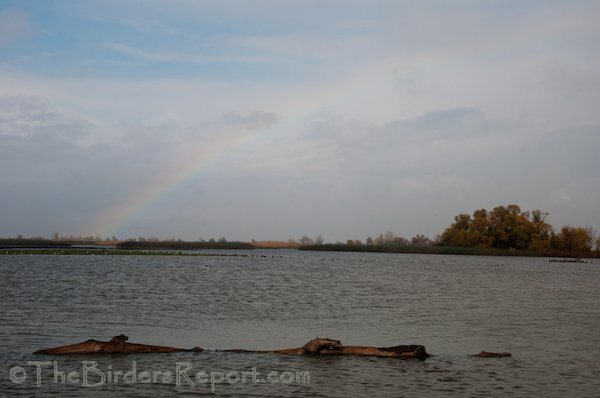 As I said, we were at the beginning of a seven or eight day stretch of incoming storms so I chose to use the blind on the first available day for me which was Wednesday. When I arrived at 6:15 am it was beginning to rain and by the time it was light enough to photograph, it was pouring. As the sun rose somewhere behind those thick clouds, it began to get a bit lighter on the water and I got some pretty good shots of what I think is one of the most handsome of dabbling ducks, the Northern Pintail (Anas acuta). Just look at this drake. What’s not to love about this dude? His mate is no slouch either! Look at this beautiful patterned plumage. The Northern Pintail is abundant in North America and is found across the Northern Hemisphere. The map below from Wikipedia Commons shows their nesting area in light green, all year resident in dark green, wintering area in blue and the red X’s where vagrants have been spotted. Being an early fall migrant, most of the Northern Pintails are paired up by this time of year although I did see several unpaired drakes like the six birds in the top flight photo engaged in aerial pursuit flights. Paired and unpaired males may instigate these pursuit flights by pressing close to the female. The flights are conspicuous because birds fly high, range widely, and can include as many as 16 birds and last over thirty minutes1. These two birds pictured below were obviously a pair. and another great reason to support a Federal Wildlife Conservation Stamp! An alternative income stream for our National Wildlife Refuges would not only help our dabbling ducks but all the non-game species that get lost by the wayside. If you haven’t read about it yet, read my post on the Federal Wildlife Conservation Stamp and look forward to progress on this front as we get serious with our legislators after the beginning of the new year. We want to see more photography blinds and birding projects on our refuges so we can get views like this one taken from blind #2 once the sun came out! the pintails are such graceful ducks! beautiful shots! …stunning, Larry. These are some of my most favorite of your photos. Such a gorgeous duck! The flight photo is perfect, and the head-on shot of the male in the rain is beautiful. Great shots – these are wonderful ducks – I dont get to see them anymore. Back in the dim and distant past I worked as warden on a series of nature reserves in the NE of England – I found a pair of these on one of our lakes early one morning – that was good start to the day. Beautiful shots and instructive video, Larry. You show why they earned their name! Thanks for sharing those shots and video Larry. What a beautiful, photogenic species. Yes to everything you said about refuges and funding. 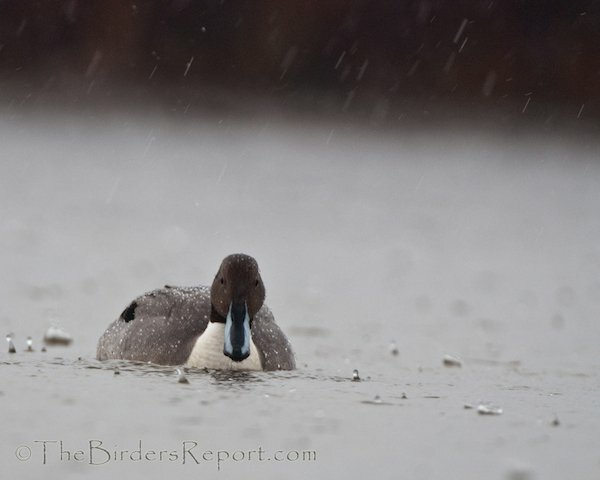 And … I’m in love with your image of the solitary Pintail in the rain. It’s so atmospheric and serene. Beautiful shots, Larry — of one of my favorite ducks — probably one of everyone’s favorite ducks, they’re so handsome. Lovely post Larry, pintails are very photogenic, however the last one is a super shot. 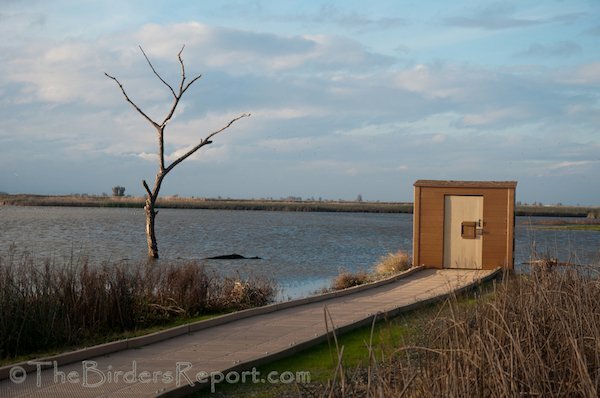 I could spent hours in a bird hide watching the world go by. 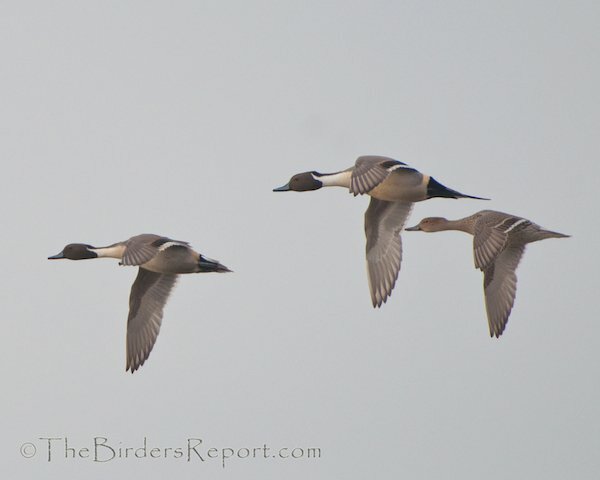 Wonderful images of the pintails, Larry! Your narrative and the bonus video are excellent! Larry, what wonderful images! I’m on the bandwagon with the others for the drake in the rain as a really great shot. Thank you for yet another informative post.